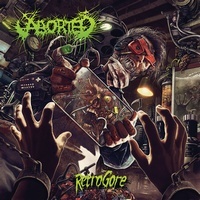 Coming hot off of the recently issued 20th anniversary celebration that was the Termination Redux EP, Aborted are back with their latest full-length, the lovingly ‘80s-inspired Retrogore. Not exactly “retro” in terms of the Aborted sound, there’s been plenty of artwork tossed our way (including the killer cover art) and some inspired movie posters with Aborted members taking the lead in the design, alongside some lyrical inspiration. With all of the cool lead-up material, Retrogore itself does match the ‘80s love that has preceded it. Twenty years in, no one is expecting Aborted to go ahead and change their formula, especially considering the success of the last few albums. Listeners get pretty much what they are expecting with Retrogore, but there are a few tricks up the sleeves. For one thing, the songs themselves feel more balanced, with brutality and melody woven into each track in a way that seems more uniform and less, “here’s a brutal track, and there’s a melodic track.” The atmosphere on a track like “Bit by Bit” adds an ominous touch to an otherwise relentless track, bringing you back past the initial adrenaline injection (along with those massive grooves). “The Mephitic Conundrum” also boosts the groove factor and squeezes in some nice, mid-tempo melodies to counter against the frantic speed that keeps things moving. Ending things on a high note, “In Avernus” is the album’s strongest cut, moving into moments of dissonance mixed with the Aborted sound to create something that’s equal parts unexpected and undeniably cool. Some tweaks in the atmosphere and melody department keep Retrogore feeling fresh from beginning to end. 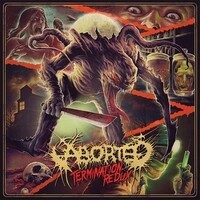 Continuing a streak of strong releases over the past few years, Aborted have finally started being seen as one of the genre’s leaders (the 20 year mark probably didn’t hurt either). For good reason – Aborted are masters of death metal brutality with a keen ear for melody and groove. Both of which have plenty of screen-time on Retrogore.